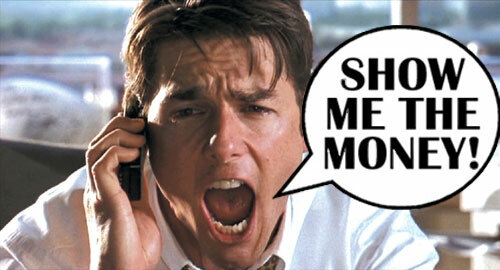 Exercise #80 : "Show Me the Money"
How a character handles their money can be very telling. Does he pay his phone bill on receipt, or does he file it by due date in a color-coded filing system, or does he shove it into a pile with the junk? When splitting the bill in a restaurant does she whip out a calculator and calculate anything to the last penny with a tip of 12%? Or 20%? Or does she wait, doe-eyed, for someone else to handle it? Using high specific detail, list your character's actions, feelings, and gestures around money. Estelle has never had an issue with money. Her father is extremely wealthy and has always given her anything she ever needed / wanted. She has been kept in a financial bubble and is simply not aware of fiscal problems, debt, lloans, etc. It is also because of this that she has had no experience in handling money. Everything is paid on time for her, so she has no worries. She does, however, have a soft spot in her heart for those of the lower working class. If she is out at a restaurant she makes sure to tip her server at least 50%. She has the money, so she feels the need to share it. She's extremely generous with what she has, but she prefers to have her tips and donations cited as anonymous. For reasons discussed in her character profile (Go here for that. ), she prefers to keep herself out of the limelight. So in the end, we have someone with a desire to give who doesn't have any semblance of money handling skills. Now onto my 2nd character, Kildan or [insert futuristic name here]. He is extremely frugal even though he is doing well for himself on board. He comes from a family that is practically destitute, so he is always aware of how much money he has and how much he needs to survive. His quarters on board the Spectre are spartanly decorated with only the necessities. He very rarely buys things for himself, but no one really knows where the money that he saves goes. So he's the opposite of Estelle, keeping an eye on every cent, knowing exactly where each one goes. So that's it. :) Come back tomorrow for the character profile of [insert character name here]. It will be a blast, I promise. Not only that, but he's a really complicated character. I'm actually quite proud of him. :) Yay! I couldn't agree more! The devil is in the details. "Karl's Scene Objective (Charlie's House)"
"200 Million Dollar Lottery" & a MILESTONE!!! Pt. 2 of Catch-Up: "Napo Says"